Sometimes I am so overcome with desire for the next stage of my life that I'm left in angry disappointment at what I simply can't have yet. I've always been ahead of myself. My head before my feet. My entire body lagging behind my dreams. I wanted to be 16 when I was 12. I wanted to be 20 when I was 16. I wanted to be 24 when I was 20. And now? I wish I had a family and a home and a dog and a backyard - and that whole vision lurks somewhere in my late twenties. But I don't just want a house. I want a photo of that house filled with light and simple furniture. I don't just want a family. I want a photo of that family in perfect clothes in setting sunlight. I don't know if I even star in the photo-set that I find myself reaching for - and that's because it isn't my photo-set. It's something on Pinterest. Or a blog. Or a world I saw in a magazine. It's someone else's life that they've crafted for themselves. And I don't belong in it yet. It's really weird and really gross when I admit it out loud (out in text, I suppose). And it makes Ben so angry. The other night he sat my pouting self down and told me my life would never be Pinterest and I'd never be a millionaire and I needed to get over it and start loving the world I have right in front of me. And what a wonderful life it is. If I just take a second, I can sit back and realize that I've done a really great job in making my home and my life the perfect place (if not magazine ready, at least it looks pretty good on Instagram). I try to remind Ben that my interest in Pinterest spreads and beautiful homes full of light and pretty family portraits is the aspirational part of me looking forward and ahead. I like to be in motion. It doesn't have to do with not loving what I have - it has to do with wanting to make everything around me better and better... until it's perfect. I feed off of the environment around me - the happier it feels, the happier I feel. It's a creative extension of me. But to him - pitching a fit about wanting my life to be something more says to him that I don't love the life I have. And I really, really do. So this week is dedicated to loving those around me and loving the absolutely privileged life I lead here in a cozy, gorgeous home with my best friend. No Pinterest envy this week. No blog envy. Just quiet inside, away from the chill, happy. I love the coat, you totally rocked it! 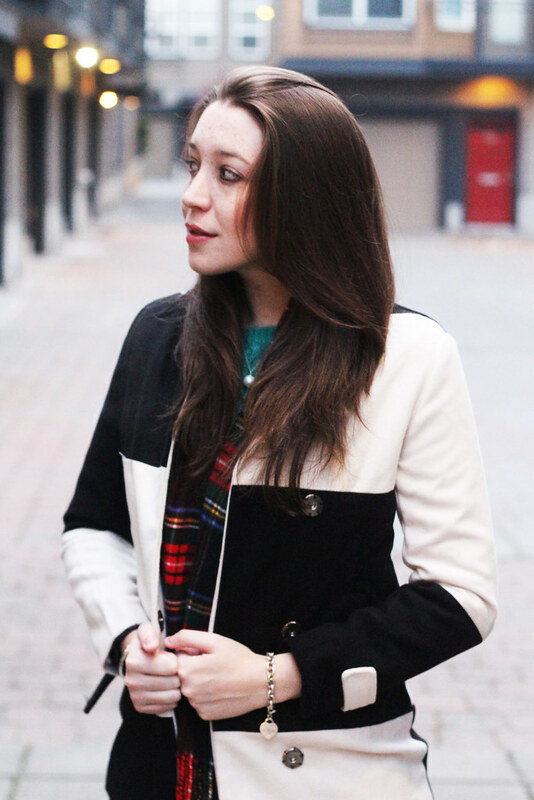 Love that jacket with the plaid, goes so well together! I love the different blocks of color on you coat, so fun! That coat is darling! 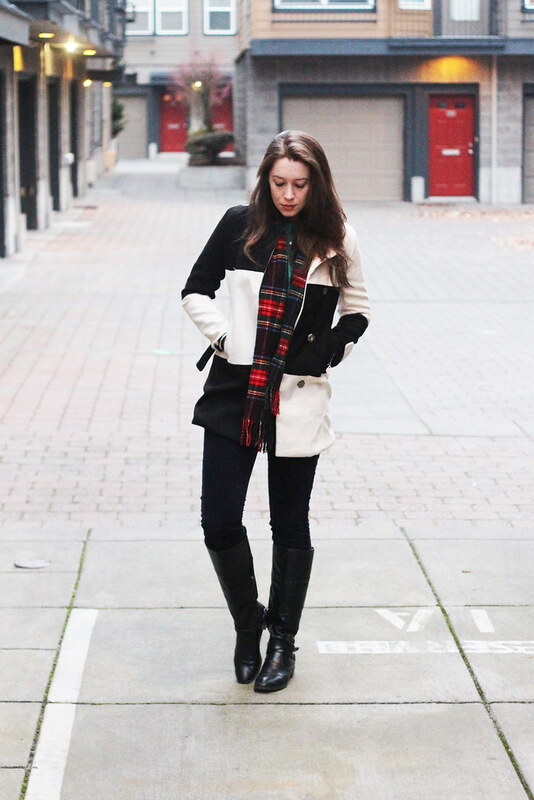 Love it paired with the plaid! I love this coat, what a great statement piece! Gorgeous pictures and look. I love that coat! 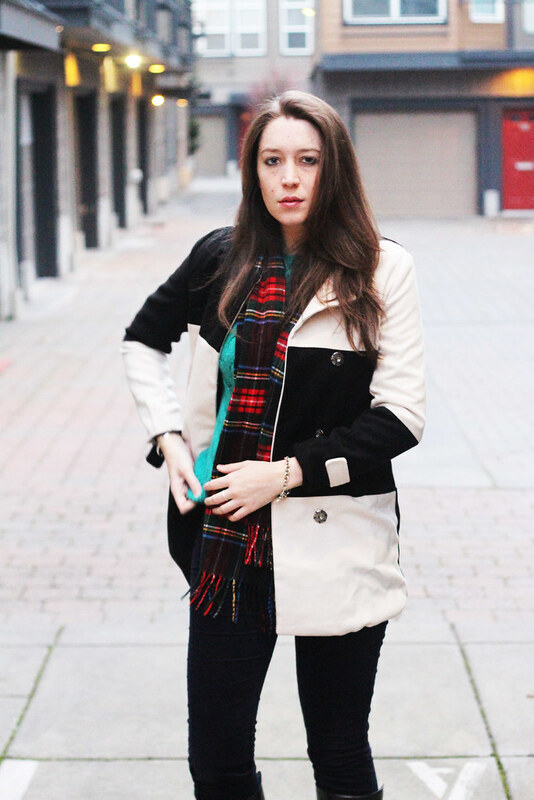 obsessing over your scarf! You are so cute. Pinterest - and the internet in general - is a beautiful representation of real life, but it hides the ugly parts. Who wants to see that? No matter how wonderful those houses and people, they have their own "angry disappointment" about things... Cheer up, and enjoy your twenties! 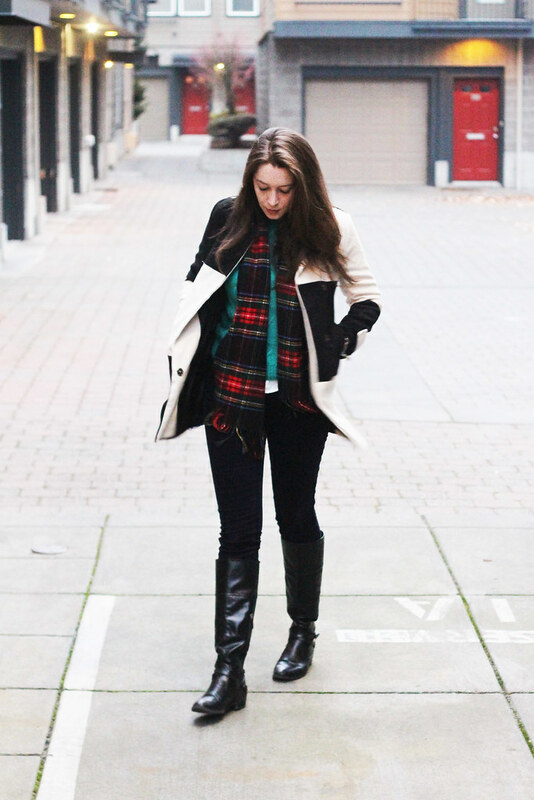 Love your plaid scarf, it looks so cozy! I think its natural for us to pine away for photos we see online. We all do it. But as you said, that doesn't mean we don't love already what we have! Remember the things we love, the things that are around us, the things that make us happy and smile (and take inspiration from online to make small improvements). This way we can have a little of both...our own beautiful lives and a hint of that perfection we see on pinterest. Great post, thank you for this. I love the scarf with the coat! Oh my gosh Kelsey I LOVE this outfit on you! It may be my favorite of yours, ever! I can relate to that feeling of wanting to be at the next stage already. I fall victim to the head before the feet situation all the time. But it is nice to sit back and enjoy the moment and they can happen at the same time, for sure. Stunning outfit! :) I really love yor style! Great advice to focus on what we have, not what we don't have! It's great to have a vision and dreams but not at the expense of today. 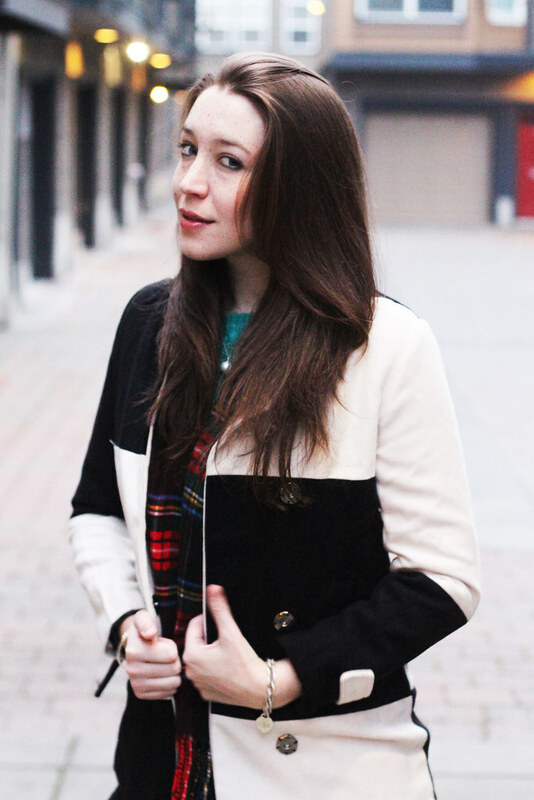 Hey I've been on the search for a good winter coat and I really like yours. Would you give a review about it? Warmth? Fit? Shipping details? Etc. You totally rock the coat, btw! Happy Tuesday!